BitKonan.com Review 2019 – Scam or Not? 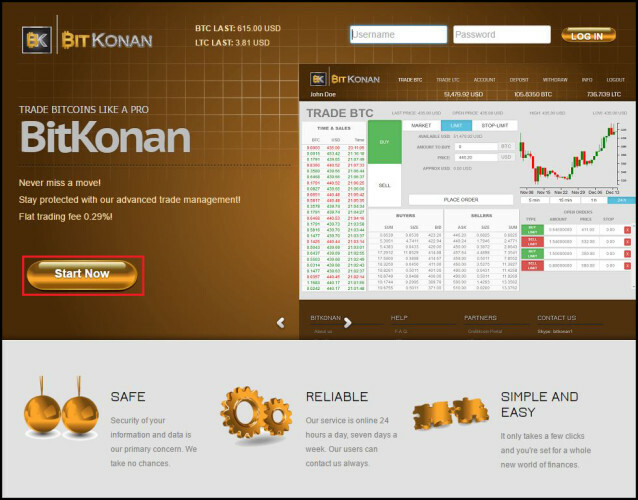 Bitkonan is a small Bitcoin exchange founded by Croatian entrepreneur Tomislav Vajic in 2013. The company is based in Split, Croatia. Their website servers are based in Netherlands and partly in the US. The exchange has low fees, and its focus is shifting towards International market from the Croatian market. There is a standard verification requirement on Bitkonan. The registration process is very simple – the user simply puts the first and last name, as well as an email address in the fields. Then the confirmation email is sent to the address submitted by the user. The confirmation email contains a generic username and a password which is used to log in for the first time. After logging into the exchange, the user needs to provide a picture of an ID (national ID card, driver’s license or Passport) and a utility bill picture with the corresponding name on it. After verification, the user can make a deposit and begin trading without any limitations. Currently, Bitkonan accepts only US dollars. When it comes to the digital currencies – it accepts Bitcoin and Litecoin. The exchange supports wire transfers. The exchange has a flat fee of 0.29 percent on every transaction made by the users on the website. Bitcoin and Litecoin deposits are free of charge, and the funds are ready for use after six network confirmations. Deposits made via Croatian banks before 14h will be processed the same day. The funds are automatically converted to US dollars and credited to the user account on Bitkonan. The exchange doesn’t charge the transaction fee, and it doesn’t have a minimum amount of deposits. When it comes to International deposits, they usually take 2 to 7 business days. The minimum amount for deposit is 50 US dollars. Transaction fees are 0.12 percent, with a minimum fee of 15 US dollars. All deposits are converted to US dollars without additional costs. The fee is 0.12 percent of the amount transferred, with a minimum of 10 USD. For withdrawals, the minimum amount is 100 USD. No fees for this type of deposits. Minimum deposit amount is 50 EUR. SEPA transfer deposits are charged with 10 EUR fee. Conversion to US dollar will be made free of charge. For security reasons, first deposit user makes is placed on hold for ten days. After the holding period passes, the funds will be available on the user’s account for trading. For beginners, there’s a video about the basics of trading. Newbies can check it below. The exchange has relatively low liquidity, and it doesn’t support margin trading or trading with futures and derivates. The interface is simple and easy to use. It looks a bit outdated, but it’s still functional. There are a few bugs on the website, with unexpected redirects, but it still works. There’s no Android or iOS apps, and the website doesn’t support mobile devices. That’s a major drawback since every serious cryptocurrency exchange needs to have a responsive website and take care of a large number of mobile users. The exchange has a quality support always willing to help, with 24/7 email and ticket system. Their FAQ page is a bit short on vital information, and it could use some work. There are no scam reports online, but some users complained in the forum about the frequent downtimes of the website. The owner explained the cause for these downtimes, apparently, there were power shortages at the time. No other complaints were posted online. Bitkonan doesn’t have any special security measures except two-factor authentication, and all of their funds are held in hot wallets. The trading platform hasn’t been hacked yet, and the hackers do not target it due to its low monthly volumes (~$60,000). The exchange has email notifications, but there are no SMS notifications, and PGP encryption isn’t used in email communication. Bitkonan is a small exchange with enough liquidity for smaller transactions and a lot of space to grow. Overall, a decent exchange with a lot of potentials.